Dana Loesch paced the carpeted stage under the fluorescent lights of a Holiday Inn one February afternoon in Portland, Oregon. A 39-year-old radio commentator and National Rifle Association spokesperson, Loesch bills herself as a conservative with “punk-rock irreverence.” A crowd of her fans, some older in windbreakers and MAGA hats mixed with some younger people, nibbled cold cuts from paper plates and drank watery coffee as they waited eagerly to see — in real life — the host of the Dana Show: The Conservative Alternative. So began Oregon’s 2018 midterm election year, in what are extremely divisive times for the state, and the nation. Oregon is part of the West Coast blue bloc, flanked by Washington and California, with a heavy Democratic presence in Portland and the surrounding Willamette Valley set against the largely rural, red, portions of the state. The 2016 election energized both sides. This year, 17 candidates are vying for governor (the most in two decades), and 11 are running for a seat in congressional District 2. That seat — in a district that covers the eastern two-thirds of the state and is larger than any state east of the Mississippi River — is currently held by Oregon’s only Republican congressional representative. Democrats see 2018 as an opportunity to expand their reach in a state where Hillary Clinton defeated Trump in the 2016 election by 11 percentage points. Republicans, meanwhile, are determined to renew their influence in the same state, where Trump won 28 of 36 counties. How either party will fare remains unclear, but as the two very different gatherings in Portland show, the emotional carryover from 2016 is still at work. 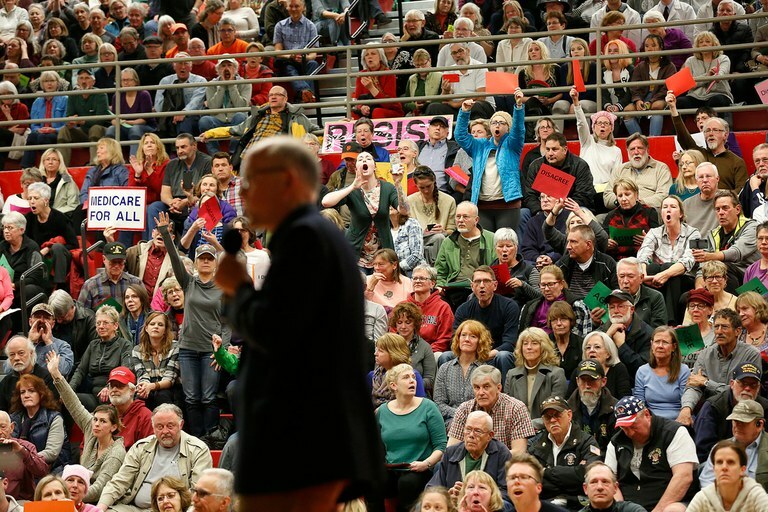 People criticize U.S. Rep. Greg Walden, R-Ore., during a constituent town hall meeting in 2017 in Bend, Oregon. Walden is expected to win reelection in the midterms even with so much polarization in the state. The Resistance is also riding the past two years’ emotional turbulence into the midterms. Composed of Democrats, socialists, anarchists and supporters of the failed Democratic challenger, Vermont Sen. Bernie Sanders, the Resistance is hoping to influence city, county and state elections. “We are resisting policies that are top-down driven to continue the status quo of increased isolationism, increased wealth inequality and injustices, particularly in the criminal justice system,” Ofsink said. Chief among those are federal attempts to sway states on immigration and climate change issues. 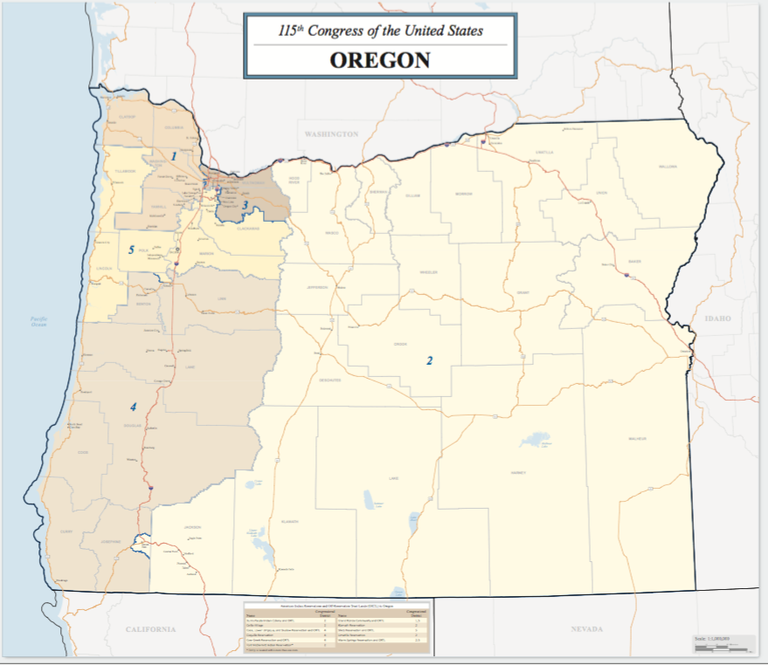 Oregon's 2nd Congressional District covers roughly two-thirds of the state. Despite political divisions, the state Legislature actually passes the great majority of its bills with bipartisan support, Moore said. Depending on which candidates come to the fore, ballot measures on gun regulations and unions, issues that will be finalized in July, may overshadow the elections. As in other states, how the midterms play out depends on whether a blue wave materializes, and on what the Republican voters decide they want — a moderate, a Trump candidate, or somebody in-between. “It’s the same discussion as everywhere,” Moore said.